CONVENIENCE • The AnMed Health Total Joint Academy now brings all aspects of care related to joint replacement surgery under one roof. From screening and classes before surgery to check-in on the day of surgery to inpatient recovery and rehabilitation – you'll find everything conveniently housed in a single location at the AnMed Health North Campus. COMFORT & SUPPORT • The Total Joint Academy is designed to create a relaxing, healing environment where patients can recover with the support of their loved ones and the camaraderie of fellow patients. The program features single rooms with plenty of space for caregivers, cherry wood floors and large windows with tranquil views. AnMed Health also promotes a team approach to rehabilitation through group therapy sessions. By encouraging and supporting each other during inpatient therapy, patients recover more quickly. TECHNOLOGY & EXPERTISE • The Total Joint Academy's orthopedic surgeons specialize in knee, hip, shoulder and total ankle arthroplasty procedures using leading-edge technology and techniques. Central to the Total Joint Academy is a new state-of-the-art operating room specifically designed for joint replacement procedures. It features integrated video with high-tech plasma screens for arthroscopy and total shoulder or total knee procedures. The room has digital imaging for navigational knee procedures and other computer-assisted alignment capabilities. ROAD TO RECOVERY • A new inpatient rehab gym is located on the unit for group and individual rehab therapy during your hospital stay. The new gym features recumbent bikes, physical therapy tables, stairs and more space for group therapy. A team of certified physical therapists and occupational therapists will provide care for patients after surgery, seven days a week. AnMed Health also offers home therapy for patients after their discharge from the Total Joint Academy. 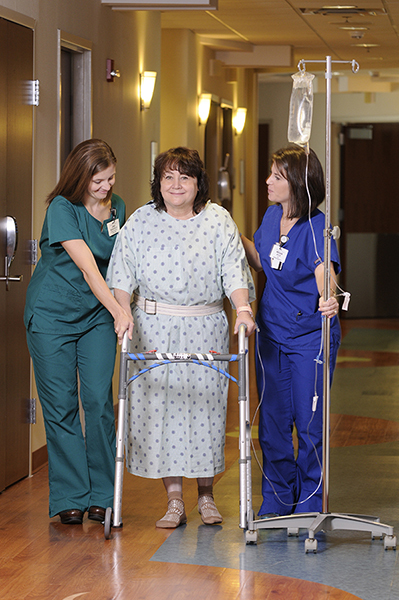 AnMed Health Home Care partners with your surgeon to implement special therapy protocols designed to help you transition from hospital to home and regain your mobility. CONTACT US • For more information about the Total Joint Academy, please call 864.512.4101.